Andrew is an environmental chemist whose work focuses on environmental analysis and monitoring of air, water, soil and sediments. He is also the Education Director for University Programs at BIOS. As lead scientist on both the BIOS Bermuda Environmental Quality Program and the Tudor-Hill Marine Atmospheric Observatory, he maintains multiple field stations that collect data on terrestrial and atmospheric contaminants, meteorological conditions and ambient air and water quality in Bermuda. Using these data, Andrew is working to understand more about the interface between the ocean and the atmosphere, and the implications for environmental and human health. 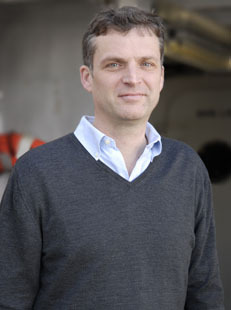 His current research includes investigations into water vapor stable isotopes in the atmospheric marine boundary layer of the Atlantic Ocean, and links between air quality and human health in Bermuda. He received his PhD from the University of Southampton in 1992, where he studied polycyclic aromatic hydrocarbons in seasonal snow cover. Andrew held postdoctoral positions at the National Water Research Institute in Canada and at the Universities of Reading and Lancaster in the UK. Prior to joining BIOS he was a research scientist at the NERC Centre for Ecology and Hydrology, also in the UK. Environmental monitoring, sampling and analytical techniques, ambient air quality, atmospheric deposition and acid precipitation, persistent organic pollutants, long-range atmospheric transport of contaminants, risk assessment of heavy metals in local soil and drinking water. Altieri, K.E., M.G. Hastings, A.J. Peters, S. Oleynik, and D.M. Sigman (2014) Isotopic evidence for a marine ammonium source in rainwater at Bermuda. Global Biogeochem. Cycles, 28, doi:10.1002/2041GB004809. Altieri, K.E., M.G. Hastings, A.R. Gobel, A.J. Peters, and D.M. Sigman (2013) Isotopic composition of rainwater nitrate at Bermuda: The influence of air mass source and chemistry in the marine boundary layer. J. Geophys. Res. Atmos., 118, 11,304-11,316, doi:10.1002/jgrd.50829. Altieri, K.E., M.G. Hastings, A.J. Peters, and D.M. Sigman (2012) Molecular characterization of water soluble organic nitrogen in marine rainwater by ultra-high resolution electrospray ionization mass spectrometry. Atmos. Chem. Phys., 12, 3557-3571, doi:10.5194/acp-12-3557-2012. Berkelhammer, M., H.C. Steen-Larsen, A. Cosgrove, A.J. Peters, R. Johnson, M. Hayden, and S.A. Montzka (2016) Radiation and atmospheric circulation controls on carbonyl sulfide concentrations in the marine boundary layer. J. Geophys. Res. Atmos., 121, doi:10.1002/2016JD025437. Gobel, A.R., K.E. Altieri, A.J. Peters, M.G. Hastings, and D.M. Sigman (2013) Insights into anthropogenic nitrogen deposition to the North Atlantic investigated using the isotopic composition of aerosol and rainwater nitrate. Geophys. Res. Lett., 40, doi:10.1002/2013GL058167. McInnes, M.A., D.A. Ellis, E.M. Webster, and A.J. Peters (2013) Sea spray and the atmospheric transport of nonylphenol ethoxylates. A combined laboratory, field and modeling study. Atmos. Env., 69, 304-312. Peters, A.J. and A.N.S. Siuda (2014) A review of observations of floating tar in the Sargasso Sea. Oceanography 27(1): 217-221, http://dx.doi.org/10.5670/oceanog.2014.25. Peters, A.J., K.L. Weidner and C.L. Howley (2008) The chemical water quality in roof-harvested water cisterns in Bermuda. Journal of Water Supply: Research and Technology 57.3, 153-163. Shoeib, M., P. Vlahos, T. Harner, A. Peters, M. Graustein, and J. Narayan (2010) Survey of polyfluorinated chemicals (PFCs) in the atmosphere over the northeast Atlantic Ocean. Atmos. Env. 44, 2887-2893, doi:10.1016/j.atmosenv.2010.04.056. Steen-Larsen, H.C., A.E. Sveinbjornsdottir, A.J. Peters, V. Masson-Delmotte, M.P. Guishard, G. Hsiao, J. Jouzel, D. Noone, J.K. Warren and J.W.C. White (2014) Climatic controls on water vapor deuterium excess in the marine boundary layer of the North Atlantic based on 500 days of in situ continuous measurements. Atmos. Chem. Phys. 14, 7741-7756, doi:10.5194/acp-14-7741-2014.